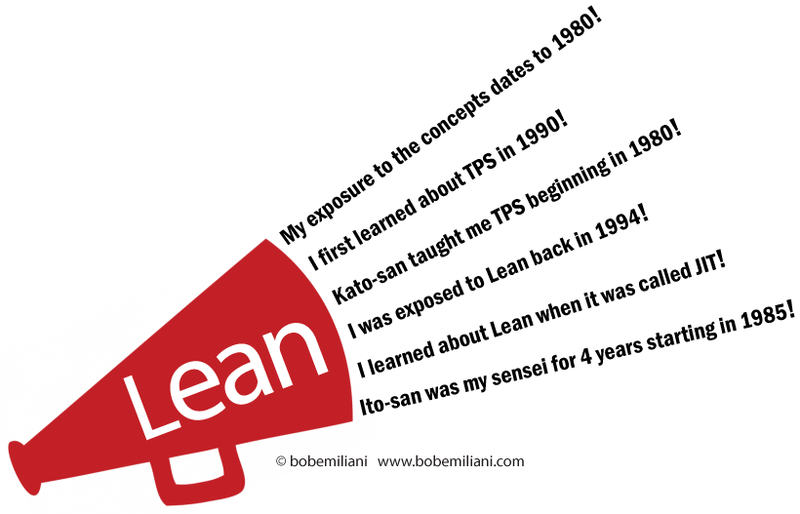 One thing that Lean people like to do is brag about when they first learned about Lean or who they learned it from. We want to show off how close we were to the beginning and who our teachers were. We do it to distinguish ourselves from a crowded field of Lean practitioners ranging from know-nothing self-proclaimed “experts” to those who have repeatedly created functioning flowlines and with engaged workforces. We all do it. I’ve done it. People in other fields do it, particularly when the event is important (e.g. “I was Google employee #7”) or where the teacher is someone important such as a great musician (e.g. “I studied for 5 years under Itzhak Perlman”). But is it right for Lean people to do this? In the Western tradition, it is clearly right. In the Eastern tradition, it is wrong, because we are bragging and therefore lacking in humility – something that our sensei taught us not to do. But we do it anyway. So now, let us reflect on our lack of humility and commit to never again mentioning our Lean provenance. Lean people should not brag about their Lean provenance because someone can have 30 years of experience with Lean and know nothing more than how to use some tools, likely poorly at that, while others may be truly skilled in human relations and creating flow after only 2 or 3 years. The length of time one has been exposed to or have practiced Lean does not communicate anything of value. Another problem with bragging about our Lean provenance is that it disrespects ourselves as well as others. Perhaps without malice or bad intentions, we belittle others. And, we make ourselves small when we try to be big. The bad consequences of doing this surely outweigh the good. It undercuts our influence, creates competition where none is needed, and causes confusion with the audience we are trying to reach. Rather than brag about our Lean provenance, we should focus our energy on making work easier for people, products and services better for customers, and a stronger organization more capable of withstanding the ups and down of the business cycle. As a footnote to this article, not only is the practice of intimating one’s level of competence based on past/present associations a display of a lack of humility, but it is also very deceptive in nature. And given TRUE LEAN THINKING AND BEHAVING’s fundamental nature/essence, such actions represent an anathema to its true legacy. There’s nothing noble in being superior to your fellow man. TRUE NOBILITY is being superior to your former self! I’ve been particularly successful in recruiting Lean leaders at all levels of the organization for over 20 years. I attribute this success to my unique ability to structure my interview and assessment processes in such a way that allows me to clearly understand each executive’s Lean accomplishments measured against seven proven Lean leadership criteria (of which humility is one of the most important). It’s interesting to note that in interviews I find candidates who are the most vocal about their Lean experience (and yes, they have multiple certifications to back up their claims) are often the least qualified. On the other hand, those who eventually wind up in the most interesting, challenging and exciting new Lean roles (from President & COO, to VP Lean, to Director Operations, etc.) demonstrate their worth with the most vividly detailed, personally intimate and almost magical Lean transformation stories – recounted with humility and very clearly based on first-hand experience. Just another example of Real Lean vs. Fake Lean. Which would you rather have in your organization? Interesting post… it definitely keys off of the notion of a TRUE LEAN leader manifesting the behavioral attribute of humility. But, at the same time, it begs the question of what – in the minds and experiences of those exceptional/superior Lean Leaders – constituted REAL LEAN accomplishments vs FAKE LEAN accomplishments? Anyone who recognizes the difference realizes that a person responsible for overseeing the transformation initiative can and will lay claim to significant accomplishments in either case. The key difference is whether or not those accomplishments resulted in a SELF-SUSTAINABLE, CONTINUALLY EVOLVING/ADAPTING, HIGH-PERFORMANCE SYSTEM or whether it eventually fell prey to the more traditional and pervasive way of thinking and behaving. You mention the passion and humility with which these exceptional/superior Lean Leaders have demonstrated “THEIR WORTH” through hands-on experiences. In this regard, another question arises as to who developed/defined the seven proven lean leadership criteria in the first place? Could it be that those criteria are only a reflection of correlation as opposed to true causation? And why would anyone who understands what it takes to achieve the level of TRUE LEAN THINKING AND BEHAVING that’s represented by the TPS/Toyota Way believe that meeting these seven criteria are sufficient to achieve the targeted/desired/needed state-of-being where TRUE LEAN THINKING AND BEHAVING is being manifest on a SYSTEM-wide basis? In this regard, I’d have to say that there’s more to achieving this state-of-being than good/captivating story-telling. In fact, much like that Igbo and Yoruba (Nigeria) proverb… “IT TAKES A WHOLE VILLAGE TO RAISE A CHILD,” it takes an entire organization to make LEAN REAL. And I for one cannot imagine only seven criteria that are limited to the popular and narrowly defined notion of “LEAN LEADERSHIP” as being sufficient to identify a truly qualified and capable CATALYST FOR A LEAN TRANSFORMATION. Forgot to mention that FAKE LEAN has been around (aka in play) on a much more ubiquitous basis, and for a much longer period of time, than REAL LEAN (ala TRUE LEAN THINKING AND BEHAVING as manifest in the form of the TPS/Toyota Way). In fact, I’d have to say that FAKE LEAN has been around for at least the past 20 years. It’s only come to light as of late that the tool-driven approach to being “LEAN” (aka FAKE LEAN) is NOT in line with what is actually happening inside of a REAL LEAN organization; particularly in terms of the way that TRUE LEAN THINKING AND BEHAVING is being manifest throughout the entire organization. Newly created. High-tech consumer electronics, pre-IPO venture capital backed company, scaling up massively on global basis and totally disrupting its market (as in literally will stand this industry up on its head). Based in NYC and includes some pre-IPO equity; it’s fourth start-up for these founders and one hell of a growth opportunity. Lean is critical but that is just table stakes. Need seasoned global SVP with top manufacturing, supply chain and S&OP skills to write the road map and move them into the $ billion plus revenue range before IPO. Must know either consumer electronics or consumer durable/apparel: Apple, Fitbit, UnderAmour, Nike, Lab 126, Samsung, TREK. And knowing how Netflix and HBO create customer value a bit plus. Finally, throw in logistics knowhow as in FedX and UPS. Yep, it’s a big job to fill. Bottom line: This opportunity (and the related circumstances) strikes me as being something new/atypical in the annals of LEAN/TRANSFORMATION LEADERSHIP. Ergo, when it comes to relying on age-old, time-tested and proven lean leadership criteria, I’d be surprised that any such criteria would be well-suited to the task at hand. In other words, in order to find someone who is capable of operating “outside-the-box,” you’re going to have to start by thinking outside-the-box about the sorts of past thinking and behaving capabilities would be best applied against the requirements of this role.